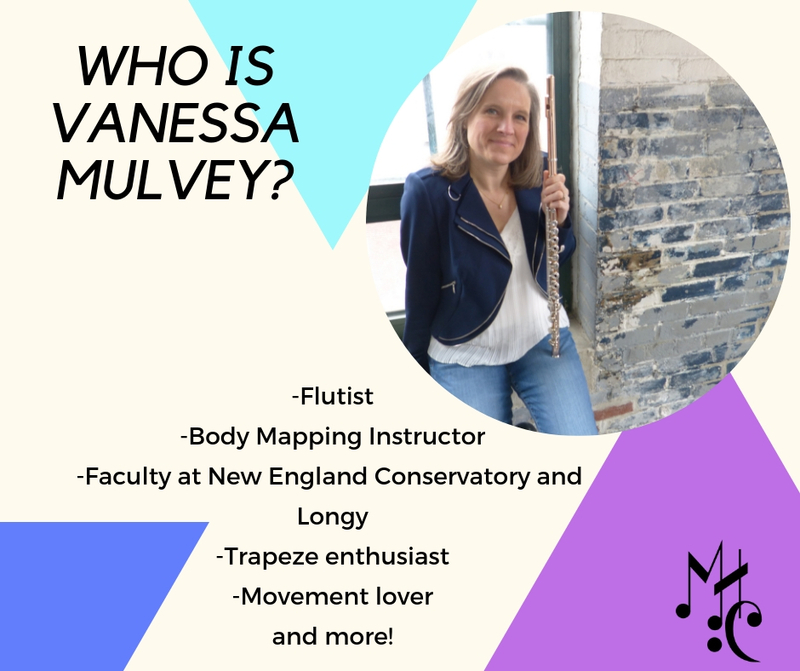 I first met Vanessa a few years ago at the Andover Educators conference, and I also had the opportunity to interview her for my blog a few years ago. But for some of you who may not be as familiar with her, here’s a little bit about Vanessa! Q: When did you first become interested in movement/mind body practices and how they affect music making? A: I became fascinated with the relationship between music-making and movement when I attended my first Body Mapping workshop. I started playing with the concepts and found solutions to obstacles in my playing including significant discomfort in my upper back. My students started progressing more quickly, I was hooked. This experience launched me in a mission to understand movement and become the best mover I could be. A: I am currently studying Core Movement Integration (CMI). In June I completed my Level 1 MovNat certification. I have learned a lot from circus art teachers including Flying Trapeze. Flying Trapeze is my ultimate challenge, because I have execute movement in less than 14 seconds. If the timing is off, you miss the catch. I am a student of Pilates and Gyrotonics. My students inspire me as well as a fantastic tribe of movers in Boston and scattered around the country. A: I love to hike in the woods with my dog. I like feeling the contour of the unpredictable terrain under my feet. I fly outside with my Trapeze friends through mid-November. This fall I have absolutely loved connecting with the people in my CMI training. We are learning to feel powerful connections in the body from the bottom of the foot all the way through the top of the head. The musicians with whom I work are eating this information up! A: i would love to have coffee with Leonard Bernstein. I love his music. Fell in love with West Side Story in high school. I would love to learn more about the inspirations for his art in the volitile period where he was creating. NEC had a beautiful exhibit celebrating his 100th birthday this fall. Q: How can readers connect with your work and offerings?